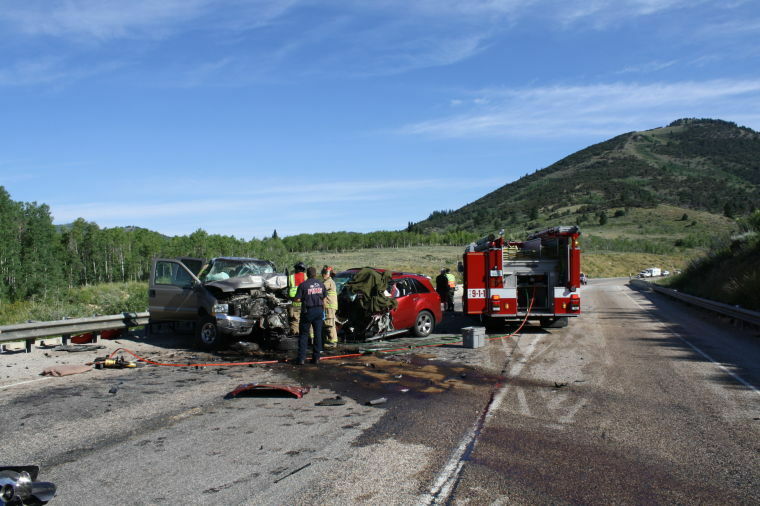 Fatal head-on collision near milepost 484 in Logan Canyon, US 89, Saturday, August 2, 2014. UHP reports a 2007 Maroon Acura, driven by 18-year-old Ryker Dattage of Hyde Park, was traveling northbound and drifted into oncoming traffic. He hit a 2002 gold Ford F-350, driven by Bruce Wilson of Hooper. Dattage is believed to have been killed on impact. Wilson had to be extricated and flown by helicopter to an Ogden hospital. Wilson's two passengers were taken to Logan Regional Hospital by ground ambulance. 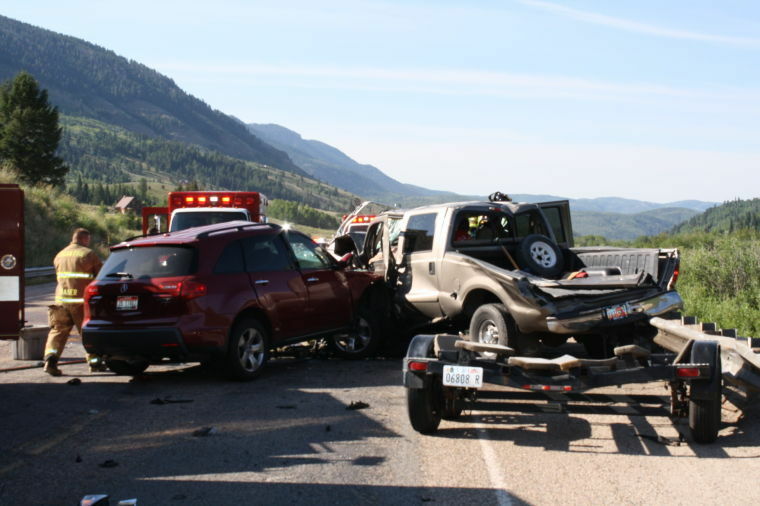 LOGAN — A two vehicle accident Saturday morning in Logan Canyon, US 89, killed a Hyde Park teenager and sent three people to the hospital, one in serious condition. Utah Highway Patrol Sgt. Cade Brenchley said a 2002 gold Ford F-350, pulling a boat on a trailer was traveling southbound near milepost 484, just south of the Franklin Basin turn-off. The truck was being driven by 57-year-old Bruce Wilson of Hooper. Two teenagers were also passengers in the truck. The three were Boy Scouts, returning home from summer camp at Bear Lake. At the same time a 2007 Maroon Acura, driven by 18-year-old Ryker Dattage of Hyde Park, was traveling northbound. According to investigators, the Acura drifted left and into the southbound lane. It is unclear if Dattage was distracted or fell asleep, said Brenchley. Wilson told investigators when he saw the Acura drift into his lane he attempted to to move to the right to avoid a collision. A guardrail prevented him from leaving the road and he struck the Acura head-on. Brenchley said Dattage was pronounced dead at the scene and is believed to have been killed on impact. Wilson had to be extricated from his truck. He was flown by Air Med helicopter to Ogden Regional Medical Center in serious condition. The two teenage passengers in the truck were transported by ground ambulance to Logan Regional Hospital. UHP Lt. Lee Perry said the accident occurred around 8:40 a.m. A Utah Division of Wildlife Resources officer came onto the scene right after it occurred and was able to radio county dispatch for help. Brenchley said the boat Wilson was pulling flew over the truck and skidded on the road about 50-feet, before coming to a stop. The road was partially blocked for several hours while crews investigated and cleaned up the accident.